Amazon recently announced a partnership with rideshare service Uber that lets you ask Alexa to order an Uber ride. All you have to do is open the Alexa app, which is available for all iOS, Android and Fire devices, click “Settings” and set the location of your Echo. Next, you’ll enable the Uber skill in the app by adding your Uber account information (or by creating an account for the first time). Then, the next time you need to go somewhere, you can use Alexa to order a ride for you and get updates on how far away your Uber is. When you say the variation, “Alexa, call me a taxi,” just expect to see a black Uber car rather than a yellow cab. If you’re like me, you order a pizza when you’re feeling too lazy to make something for dinner. There’s really nothing simpler than that, but Amazon and Domino’s have figured out a way to do make it so. Similar to Domino’s other futuristic pizza ordering ventures (you can order a pizza by tweeting, texting and smartwatch-ing), you put your Easy Order into the Domino’s phone app, then add Domino’s to your Echo’s Skills. Next, ask Alexa to place your Easy Order or another recent order, and then ask her to track your order in real time. It’s a quick — and delicious — way to make life easier. You’re home from a long, stressful day at work, and while you want to read that in-depth book on Russian literature, the thought of the eye strain you’ll have is a huge deterrent. Not a problem — just ask Alexa to read you a Kindle book. Whether your purchased it yourself or borrowed it from the Kindle Owners’ Lending Library or your Family Library, you can ask Alexa to read the title, pause, resume or go forward and backward. 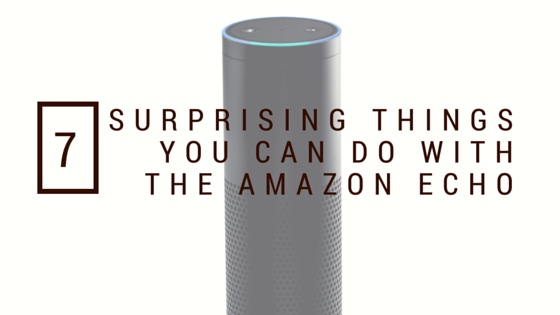 You could even use the Echo to read your kids a story while you’re busy making dinner or finishing a project. You’ll be finishing books in no time. This recently added third-party Skill will definitely get your heart rate up (in a good way!). All you have to do is ask Alexa to begin the 7-Minute Workout. The 7-Minute Workout gained attention in 2013 after researchers published a journal article about it, saying it lets you get all the benefits of an endurance workout in a time period suitable for those on the go. Just add the Skill using the Alexa app on your phone and you’ll be ready to burn those cals. Don’t forget to put on some tunes by asking Alexa to play the Cardio Dance Workout playlist from Prime music. We’ve all been there: you’re late to an appointment, but you have no idea where you put phone. Even worse, it’s on silent and calling it won’t let you know where it’s at. Amazon’s If This, Then That (IFTTT) integration can solve that. IFTTT uses rules, called recipes, to automate certain processes, so if you ask Alexa to do something, like “trigger unsilence on my phone,” then she automatically does it. And when you say, “Alexa, trigger find my phone,” she’ll call your phone for you. It’s really bringing the logic of computer programming to everyone. To begin using IFTTTs, visit the Amazon_Alexa page on IFTTT. Sign up for an IFTTT account, then select “Activate.” Then, all you have to do to get going is sign into your Amazon account to input your IFTTT account info. It’s pretty simple, and gives you even more options to make use of your Echo. Stop having those “What do you want to do, I don’t know, what do you want to do?” conversations for good using Echo’s Stubhub integration. Make sure you set your home city within the Alexa app’s Settings menu, then say, “Alexa, ask Stubhub what’s happening this weekend?” You can ask for other dates and times, too, and can even ask what’s going on in another city if you’re planning a fun getaway. And if you want to know what people are saying about the venue (or you decide that staying in and ordering take-out is a better option), the Yelp Skill can help you find exactly what you’re looking for and elaborate with even more info. You can now play the classic trivia game Jeopardy! through Echo. Whether you’re having a party and want to entertain with the game or you’re looking to show off your obscure knowledge in a smaller setting, asking Alexa to “start Jeopardy!” will bring you a ton of brain-bending fun. While it’s Alexa’s voice — not Alex Trek’s — that will guide you through categories like sports, pop culture and history, it’s still pretty cool. Just make sure to answer in the form of a question. If you thought these seven things were cool, there’s a lot more where that came from! The Amazon Echo is available on Amazon for $179.99, but for a chance to win an Echo, enter our giveaway by February 13.
does anyone check these articles? There is a typo on the VERY FIRST TOPIC. “Call FOR a ride” not “FAR”. Yes, but we don’t catch every error before it goes into print. We don’t like mistakes, but they happen.